Back in October I had a weird allergic reaction to shrimp. I say “weird” because it was the first time I’ve ever had a reaction to food but considering E’s food allergies I guess it wasn’t that strange. 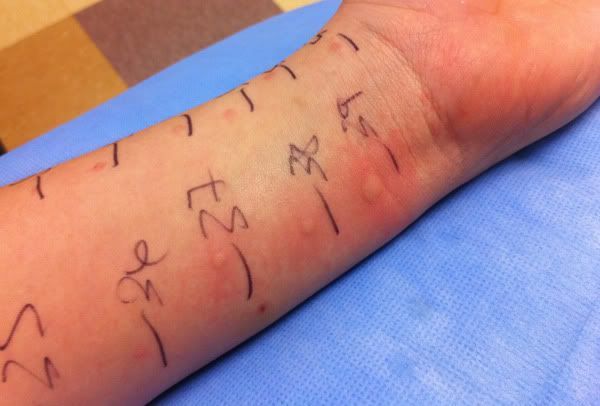 I went to the allergist on Tuesday to get tested for food and other allergies. The good news?–I tested negative for shrimp and other food allergies. The bad news–I am crazy allergic to cats, dogs, weeds, grass, and dust mites. But I kind of already knew that any way so it’s not a big deal. Even with the negative skin test the doctor still wants me to avoid shrimp for a year and then come into the office for a “food challenge” (e.g. sit in their office and eat a bunch of shrimp). I’m also supposed to carry around an Epi-pen for myself but I already have a kid-sized one for E and they are awfully expensive so we’ll see. This puts a bit of a damper on my preferred method of celebrating New Year’s is to eat an inordinate amount of shrimp cocktail. Oh well, I guess there’s always assorted cheeses and cured meats. Sorry about the no shrimp! Which allergist do you see? I need to send B for a test like this. Emily, I'll email you the info.